CRICKET: Pakistan beat Sri Lanka by 21 runs with a superior team effort in the third One day International to go up 2-1 in the five-match series at the Dubai International Cricket Stadium on Friday. The result will put the Sri Lankans in a must win situation when they take on Pakistan in the fourth ODI on Sunday at the Sharjah Cricket Stadium. The Pakistan bowlers and batsmen stuck to their job admirably to insert the pressure on the Lankans as they succumbed to the situation falling short by 21 runs. At one stage, the Islanders seemed to be well on course with Sangakkara, Dilshan and Mahela Jayawardene coming together, but a bad mishap saw Sangakkara being run out and Dilshan, after scoring 64, being bowled by Afridi and the worst to follow Jayawardene stumped by Sarfraz Ahmed over a marginal decision which went in favour. Mahela reached 10,000 runs in ODIs. In pursuit of Pakistan’s 257 for 8, Sri Lanka were bowled out for 236 in 48.4 overs. Umar Gul 3 for 48 and Shahid Afridi 2 for 42 were the pick of the Pakistan bowlers as they struck vital blows time and again. They were well supported by the spin combination of Shaid Afridi who also excelled in the field by running out Kumar Sangakkara Saeed Ajmal and Mohammad Hafeez. Soon after the match Mohammed Hafeez who won the Man of the Match award said that the going was tough while batting and bowling as the ball had the tendency of stopping, but his captain had confidence in him which gave him encouragement to continue. Sri Lanka captain Tillekerane Dilshan said that Sangakkara’s run out and his dismissal were disappointing. However the bowlers did a good job in the last 20 overs or so which restricted the scoring. 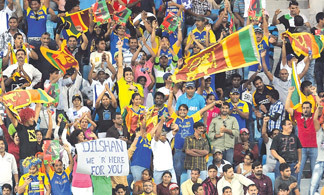 “I feel I should have batted throughout the innings,” Dilshan added. Sri Lanka got off to a horror start losing Upul Tharanga in the second ball of the innings after hitting Umar Gul for a four in the first ball. Tharanga was beaten and bowled all ends up and Sangakkara strode into the wicket virtually as an opener as he has done the role previously on several occasions. With only 5 runs on the board and chasing a 250 run plus total, the two senior batsmen, Dilshan and Sangakkara had a big job in hand. Both batted with caution and aggression. They took the score from 1 for 5 to 111 for 2 when disaster struck Sri Lanka. The manner in which the pair ran between the wickets, it was destined that one could get run out, finally Sangakkara managed to do it. After sharing a 106-run stand for the second wicket Sangakkara played one to the mid on region and was off the blocks in a flash which resulted in a run out off after a throw from Afridi. Mahela Jayawardene looking to get his 10,000 runs in One-Day International cricket walked in to join Dinesh Chandimal, Mahela reached the milestone, but was stumped off Ajmal for 17 and Sri Lanka was 168 for 4 at that stage. Jayawardene reached 10,004 runs in his 355 ODI career spanning 333 Innings. However, with Jayawardene’s dismissal Sri Lanka needed a little more than luck if they were to pull the match off in their favour. But, Dinesh Chandimal and Angelo Mathews made a valiant effort to up the tempo and as a result gave their wickets by trying to force the pace. Malinga in the quest of scoring quick runs, was promoted in the batting order, but he fell lbw to the experienced Afridi. The same fate befell to Jeevan Mendis who was also leg before wicket to Hafeez. When Thisara Perera came in next, Sri Lanka needed 40 runs off 31 deliveries, but Perera became Umar Gul’s second victim caught by Afridi and with the score reading 228 for 8. The Lankans, chances plummetted to zero.